Lying · Seattle, WA USA - At Our Docks! Seattle, WA USA - At Our Docks! Engines: Twin 330 hp, D-6 6-cylinder, I/O with Volvo-Penta DuoProp sterndrives. Props: 1- 4 blade, 1 - 3 blade counterrotating. Starboard outdrive replaced with DPH-D, Summer 2016. New bellows on Volvo outdrives: Fall 2018. Bottom paint on hull and outdrives: Fall 2018. NOTE: there is also a small 13 gallon GAS tank for the trolling motor. Holding (1 - black water; 1- gray water): 15 gallons each; aluminum. Macerator discharge for both tanks. Boarding is via the large swim step and through a transom gate on the starboard side. The outboard Yanmar (Gas) trolling motor is to port with storage boxes welded to the center of the swimstep. The large cockpit is set up with a large fillet station, several storage boxes, and large lazarette locker which holds the generator. The sink is to port while the steering/trolling station, with an 8" Furuno display and aft camera, is starboard. The 10’ Walker Bay RIB dinghy is mounted on a welded cradle on the roof top and is deployed via an electric Roskelley-Olsson davit system. Photos in our presentation show the boat on a trailer to indicate the possibilities; no trailer is included or available. Entering the main cabin via the sliding door, the craftsmanship and interior details are high quality and quite remarkable. Heavy duty, attractive vinyl upholstery (you can easily mistake it for leather!) seating with beautiful teak cabinetry throughout. A convertible dinette (sleeps two) with seating for four is to port. The forward facing bench for the co-captain could seat two. The helm station to starboard has excellent 360 degree visibility through very large windows. The helm seat is adjustable and has shock absorption for maximum comfort and support in any seas. There is a defrosting/heat system at the front windows to keep them clear in inclement weather and a Webasto diesel furnace for comfort in cool weather. The forward cabin has a large hanging locker to starboard and storage drawers under the V-berth. The lighting in the cabin via the overhead hatch and port lights gives the cabin an open feel. The head compartment is to port with an electric head, sink and shower capability. Hull construction: Deep V with 20 degree dead rise. Trolling motor: 25hp Yamaha - GAS - long shaft, Hi-Thrust. 13 gal. gas tank. Trailer in photos not included or available. Furuno 1823C Color radar display and chartplotter. Furuno 8" Chartplotter/fish finder for aft station. AirMar B-260 thru hull trnasducer with high speed fairing block. iCom VHF with aft station command microphone. Cold Water Boats enjoy a well-earned reputation of high quality, top performance and rugged construction with accommodations for comfort and extended cruising. Each model is a semi-custom design. The aluminum exterior is inherently corrosive resistant and extremely functional: deep-V hull, non-skid surfaces, large cockpit, sturdy welded stanchions and handholds. Engineered and designed for recreational use yet born from a history in the commercial fishing industry. The interior is well-lit with large windows which allow for unobstructed visibility and a Webasto diesel furnace provides comfort year round. These features coupled with high quality, heavy duty vinyl upholstery, a beautiful teak interior and a spacious queen forward cabin with private head show the manufacturer’s commitment to quality craftsmanship, inside and out. If you are considering an offshore aluminum pilothouse fishing boat from SeaWolf, EagleCraft, Almar, Duckworth, Armstrong Marine, Coastal Craft or Kingfisher but would like additional area in the cockpit and in the cabin be sure to compare the quality of craftsmanship and construction with our Cold Water 3700. 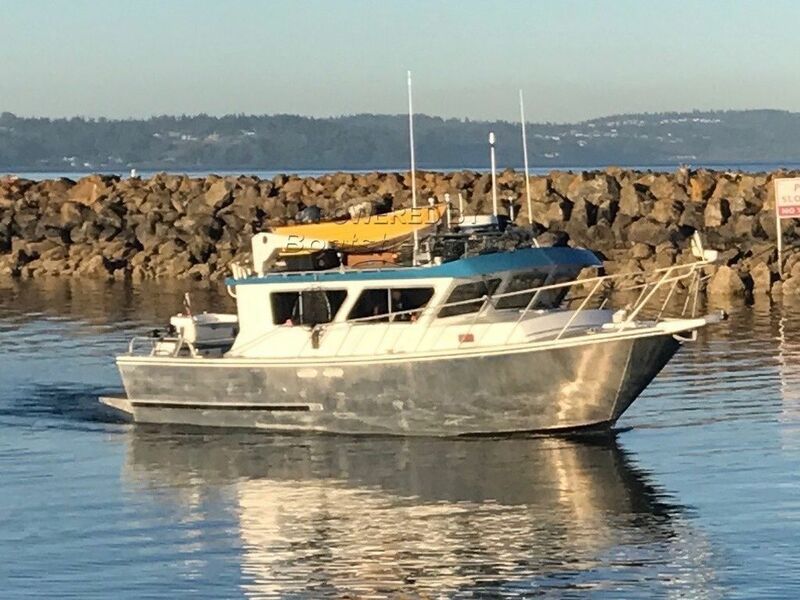 This Cold Water 3700 Pilothouse has been personally photographed and viewed by Gretchen Miles of Boatshed Seattle. Click here for contact details. Please note this comments section is public. Please do not post your personal details here. To enquire about purchasing this boat, please contact the broker directly at gretchen@boatshedseattle.com. Please read our commenting guidelines before posting.